It's time for spoilers once again! Tomorrow will be the last day of spoilers this week. So, let's begin. 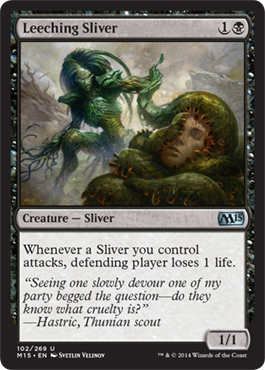 Our first member of the sliver cycle in M15 is Leeching Sliver. Each sliver you attack with, the player you attack loses life. 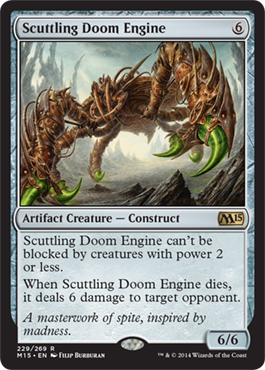 It may be a 1/1, but with the other slivers, this one will also be really powerful. This card is also really powerful. Three mana with red's form of card draw. 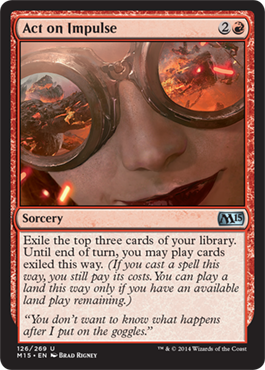 You exile cards from your library and can play them for the turn. After that you lose them. It can be a good card, but if you don't have enough mana, you can't cast some of the spells. 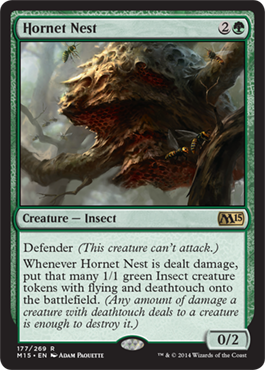 It may just be a 0/2 Defender for three mana, but if you block damage with it, you can create that many flying 1/1 insects with deathtouch. Kalonian Twingrove relies on forests. Even with four forests and mana ramp, you will still have a 4/4 for six mana. 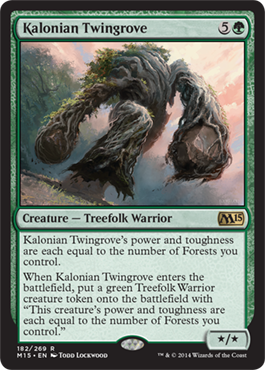 That isn't great, but then consider the Treefolk Warrior token you put on the battlefield when it comes into play that is essentially a copy of Kalonian Twingrove.